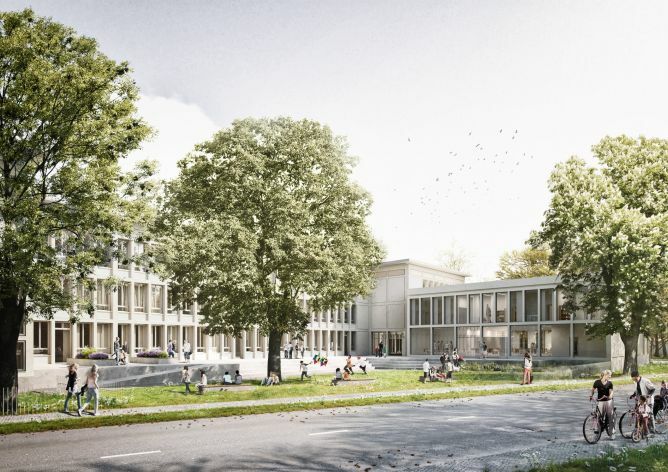 The available build parameter is located in the east of the city centre of Saarbrücken and includes the primary school Saarbrücken Ost. In direct proximity are the kindergarten and the church of the St Johann/St Elisabeth community as well as the Joachim-Deckarm events hall. Vehicle access to the area is ensured via the northern Thüringer Straße, as well as the western Hellwig Straße, which also serves as a pedestrian route. The key issues of the design involve the respectful treatment of the existing school building, constructed in 1952 by Peter Seeberger, and of the existing trees deemed worthy of preservation alongside the implementation of the required room programme. The present design approach foresees extending the existing school by two structures. 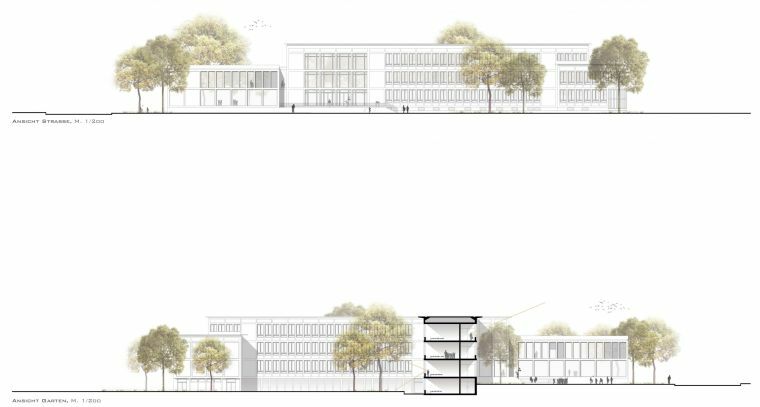 These extensions and some minimal restructuring to the existing structures will result in a future school building with a high degree of functionality, characterised by clear structures and an optimised internal flow. The new building structures almost naturally adopt the room structures of the existing school and systematically continue them. In terms of its appearance and façade, the design refers to the existing proportions and translates them into a contemporary language. 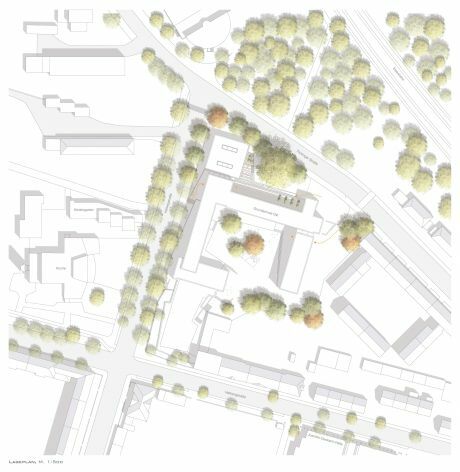 Much like the existing building, in which all the structure’s building parts are clearly set apart and identifiable, the new building volumes set themselves apart from the existing building through joints and are thus recognisable and discernible as individual bodies. A two-storey building structure, located to the north between the existing school and Thüringer Straße, houses on its ground floor the dining area and parts of the kitchen. 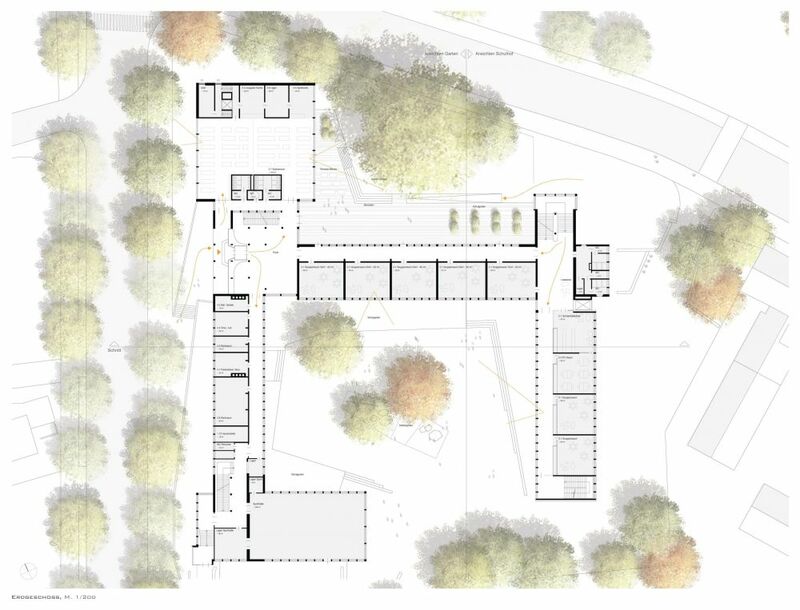 The dining area is accessed from the existing entrance hall and with its generous glass surfaces opens up onto the eastern terrace with the adjoining school garden. Seating steps enable a flowing transition between the level of the natural terrain and the ground floor. A ramp ensures barrier-free access. New doors, in the north line of the existing building, create a direct connection between the newly designed outdoor space and the ground-floor group rooms. This ensures a direct reference to the outside for the group rooms and the school garden can be incorporated into the educational concept. In addition to the increase in high-quality play areas, the school courtyard area lost as a result of the second building structure is quantitatively compensated for. Accessed via the existing main stairwell, the upper floor of the new building structure houses the administrative area of the school. 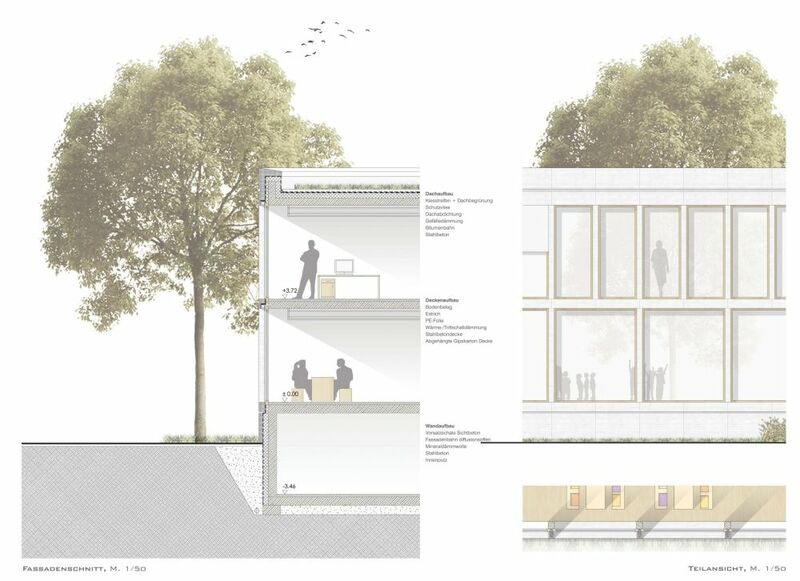 Light and generous offices encourage an efficient and structured work environment. The relocation of the administrative area from the existing building means that room is created for additional classrooms. This results in all classrooms, specialist rooms and group rooms being located in a circle around the central schoolyard. This opens up a myriad of views between the individual building parts and makes for an easier orientation within the building. The organisation principle of the single-wing construction method allows for light and open hallway areas. Classrooms and multipurpose rooms alternate with one another, allowing for their optimal use during school operation. 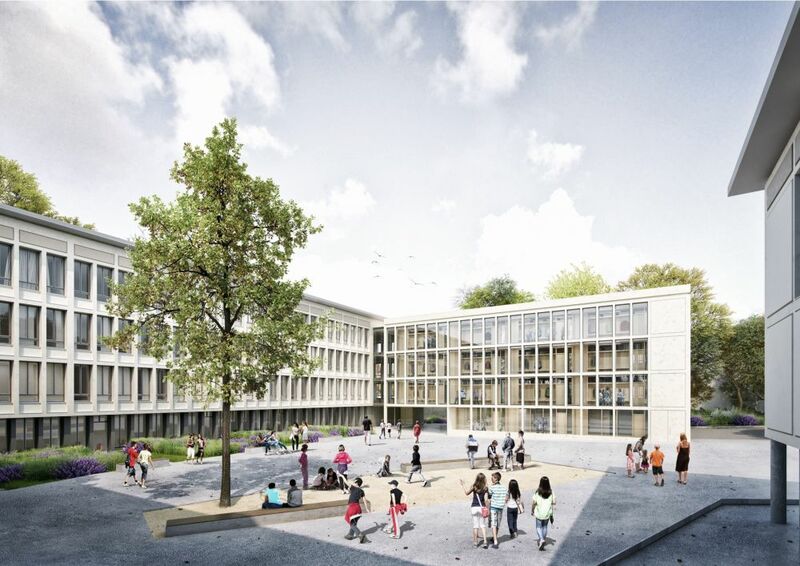 The building structure forming the southern conclusion of the school courtyard makes the latter the focal point of the school and gives it a distinctive character. Set apart by a glass section, the four-level structure connects to the stairwell of the existing building on all levels and provides a barrier-free passage. An additional staircase, at the end of the building structure, allows for a smooth evacuation. Similarly to the existing building, this structure is also based on a one-wing floor plan. The upper floors house the class and group rooms and the school courtyard level is home to a generous theatre auditorium with corresponding storage space. Access to the school building is primarily via the existing main entrance. Further access is provided by the break entrance on the school courtyard level. The lift located here provides barrier-free access to the entire building. Deliveries to the kitchen and the waste removal occur from Thüringer Straße. Access for the fire brigade is as before via the school courtyard area. The simple and timeless façade has been deliberately designed with durability and sustainability in mind. 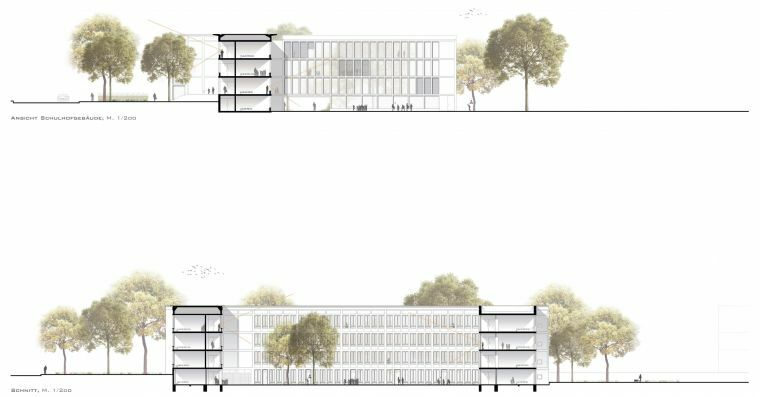 The planned modular façade system manufactured from prefabricated concrete provides a cost-effective solution and generates low maintenance costs. The scaling down of the construction and development to just a few authentic materials results in a discreet and timeless aesthetic. The wood and plaster elements used in the interior create a contemporary, high-grade and pleasant appearance, worthy of a present-day educational landscape. Thanks to the school extension design featuring two building structures, the design can be implemented without disrupting the school’s operation. A first phase foresees the erection of the northern building structure. 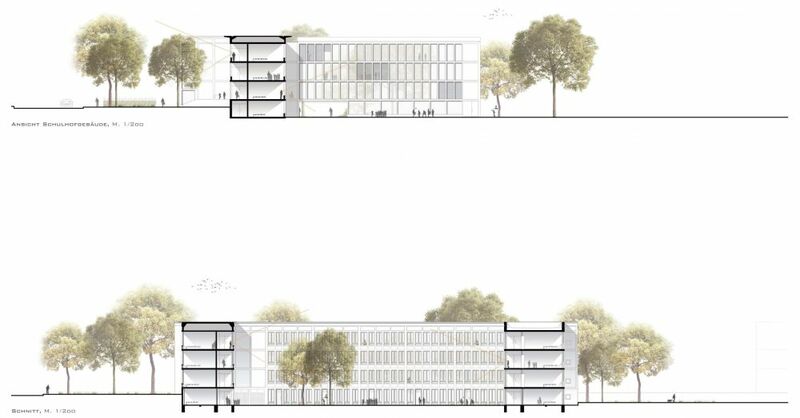 Through relocating the functions of the dining and office areas to the new construction, the existing building gains extra space for class and group rooms. A next phase foresees the subsequent erection of the second extension building, which can also be built in parallel to the school’s normal operation and joined to the existing school building following its completion.